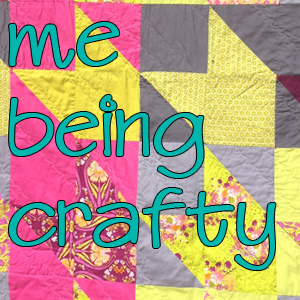 Welcome to episode 016 of the Me Being Crafty podcast, where we explore creativity in your life. In this episode I talk to Lee Monroe of May Chappell about her creative journey including changing her major in college to becoming a graphic designer and falling in love with quilting five years ago. Lee is the President (soon to be Vice President) of her local modern quilt guild and has turned her creative love of quilting into a business. She has published quilt patterns and is also teaching quilting classes. I have been reading Lee’s website for a couple of years now and I just love her tutorials and the Tuesday Tip she features weekly. We talk about how the tips can feel like they are obvious things, but to someone new, seeing that tip offers a moment of clarity. Thanks again for being on the show Lee! Lee and I had a great talk about her changing creative journey from full time graphic designer to now having a creative business. She is teaching locally in North Carolina, and expanding that in 2015. Lee has really great quilt patterns available for sale so I encourage you to check them out! 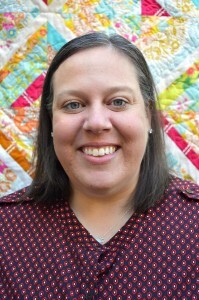 She is involved in organizing the Modern Quilt Guild’s Leadership Conference that is the day after QuiltCon ends in February, 2015, in Austin, TX. I really wish I were attending because the conference looks so good! Pablo Picasso said, “Learn the rules like a pro, so you can break them like an artist,” what a great quote for Lee to share. I definitely agree with this – you need a foundation to build on before you can start breaking the rules. I hope you are building your foundation so we can look forward to you breaking some rules! Listen to episode 015 and let me know what prompted your start with being creative, did you love your crayons from the age of two? My daughter is one who has been creative from that age, and I love watching her artistic ability grow and change over the years.